As an open education practitioner I believe it’s important to practice what I preach, so when I was invited to present a guest lecture for on “Open Education and Co-Creation” as part of an Introduction to Online Distance Learning course, I used the principles of open education to inform the design and development of my lecture. Although formal teaching is not a routine part of my role at the University of Edinburgh, in October 2016 I was invited to present a guest lecture on the topic of open education and co-creation for the Institute for Academic Development’s Introduction to Online Distance Learning course. This is an online course for staff who are involved with online programmes at the University, which runs for five weeks and features regular guest speakers who present on a different theme each week. Learners gain direct experience of working with Blackboard Learn  and Collaborate which are used to facilitate the course. As I was unavailable the week I was invited to present the guest lecture, I agreed with the course tutor to record my lecture in advance and share it with learners along with a selection of readings and additional resources. Students were expected to watch the lecture, consider new opportunities for mobile, flexible and social construction of online learning, explore some social media tools, and participate in a synchronous discussion with the course tutor using Blackboard Collaborate. (I discuss definitions of OER in more detail in Core area 3b). I then went on to outline different types of Creative Commons licences and their varying degrees of openness, David Wiley’s 5 Rs concept, and understanding open practice, before moving on to the University of Edinburgh’s OER vision, policy and service, and the role of the University’s Wikimedian in Residence in the co-creation of open knowledge. To conclude the lecture I presented a case study on co-creation focused on the work of Learning, Teaching and Web Services Open Content Curation intern, Martin Tasker. Martin’s role was to take existing resources created by students, ensure everything in these resources could be released under open licence, and then share them in places where they could be found and reused by other teachers and learners, such as TES. The resources Martin repurposed had been created by students as part of the School of Geosciences Outreach and Engagement Course, which requires learners to design and undertake an outreach project that communicates some element of the field of GeoSciences outside the university community. A key element of the Geosciences Outreach and Engagement Course is to develop resources with a legacy that can be reused by the client and developed and disseminated further for use by other communities and organisations. The Geosciences Outreach and Engagement course and the subsequent work of the Open Content Creation intern, provide an excellent example not only of community engagement and knowledge exchange, but also of involving students in the co-creation of their learning experience. In preparation for the course, I recorded my lecture using the University’s MediaHopper  media management system and shared it under a Creative Commons Attribution (CC BY) licence, I also shared my slides under open licence on SlideShare . Later, I disseminated both resources as OER on my blog and on the University’s Open.Ed portal  and disseminated them through twitter. As an advocate of open education and as an open education practitioner, I have always believed it is important to practice what I preach. In the case of my contribution to the Online Distance Learning course, that meant using the principles of open education to inform the design and development of my guest lecture. In practical terms this meant creating my course materials in such a way that all resources could be shared under open licences and made available for reuse by others, both within the University and beyond. All images used in my presentation are Creative Commons licensed and appropriately attributed so that my slides and presentation can be reused without fear of infringing copyright. I also made a point of ensuring that the tools and technologies I used to contribute to the course asynchronously were typical of the suite of tools that staff might use to facilitate online distance learning courses. Some of these tools are hosted by the University, e.g. Blackboard Learn, Collaborate, MediaHopper, while others are generic web based tools and content sharing sites such as WordPress and SlideShare. Although I use several of these tools in my own practice, this was the first time I had used them to contribute to a formal taught course, and it gave me a valuable insight into the practicalities of delivering online distance learning. For example, recording my lecture gave me with a good opportunity to experiment with MediaHopper, the University’s media asset management platform, which was new at the time. I found the process of recording my lecture and integrated slides to be extremely simple and I was then able to share it on the platform under open licence thus contributing the University’s pool of open educational resources. As the lecture was about open education and co-creation, I also felt it was important to incorporate some of the Open Content Intern’s own reflections on their work. Martin had written two blog posts reflecting on his experience of working on the project which were shared under open licence on the University of Edinburgh’s Education Design and Engagement team blog. I used two quotes from these blog posts in my case study which I felt encapsulated the ethos of open education and co-creation particularly well. A key aspect of the University of Edinburgh’s Strategic Vision is to expand its provision of world leading online distance learning, supported by an OER Policy which encourages staff to use and create open educational resources. I believe it is of fundamental importance to embed open education into the design process of online distance learning courses right from the start. This can be done by leading by example, showing how existing institutional and online tools and technologies such as BlackBoard Collaborate, MediaHopper, SlideShare and blogs can be used to support both distance learning and open education. I found the process of creating my guest lecture and associated materials as OER to be simple and straightforward. Although I don’t routinely lecture on academic courses, I often present at conferences and events and I found the process not dissimilar to public speaking. The tools and technologies I had access to were easy to use, and those I was unfamiliar with, such as MediaHopper, were well supported. Finding CC licensed images to for my presentation, was simplified by using Flickr’s license search functionality. My long standing experience of working in learning technology and open education stood me in good stead in this regard. I appreciate that some colleagues are likely to be more reticent about engaging with open education and online distance learning. In my experience, this is less an issue with technology and more an issue of practice; some colleagues are anxious that their teaching resources may not be good enough to share openly, while others are reluctant to use resources created by others. I believe that providing tailored support is key to engaging staff with open education and online learning and the OER Service at the University of Edinburgh plays an important role in encouraging and supporting staff to use and create open educational resources. Participating in the Introduction to Online Distance Learning course was an engaging and rewarding experience, and although I was disappointed not to be able to join the synchronous discussions following my guest lecture, I had another opportunity to engage in discussion around the topic of open education and co-creation several months later. 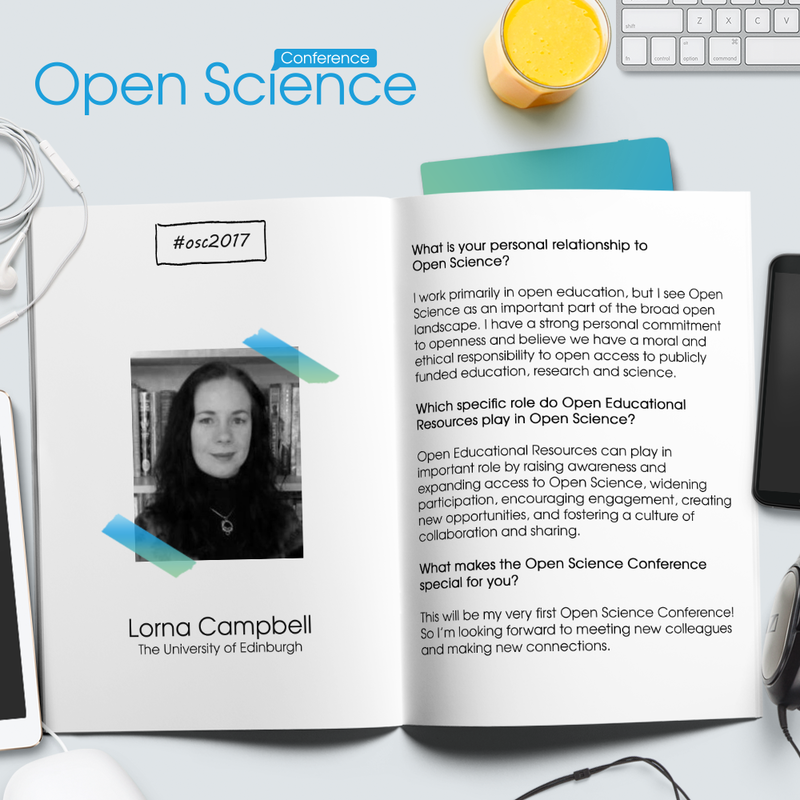 In March 2017 I was invited to present a paper on open education and OER at the International Open Science Conference in Berlin . I used my guest lecture as the basis of my talk and expanded the case study to focus more on the co-creation aspect of the Geosciences Outreach and Engagement course. My talk was well received, with several delegates approaching me afterwards to say how much they valued hearing examples of co-creation and OER used in science education. 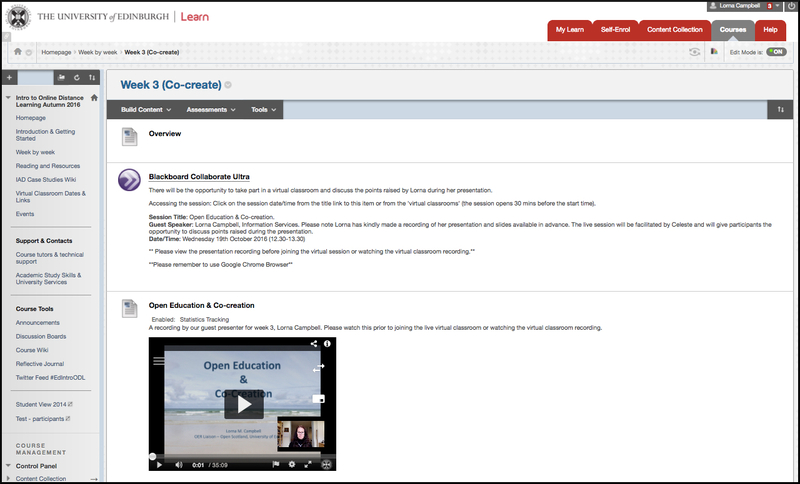 Screenshot of the Introduction to Online Distance Learning on Blackboard Learn (see above).